Wasp nest extermination, safe and local service. Get rid of your wasps nest with safe treatment by local pest control professionals. 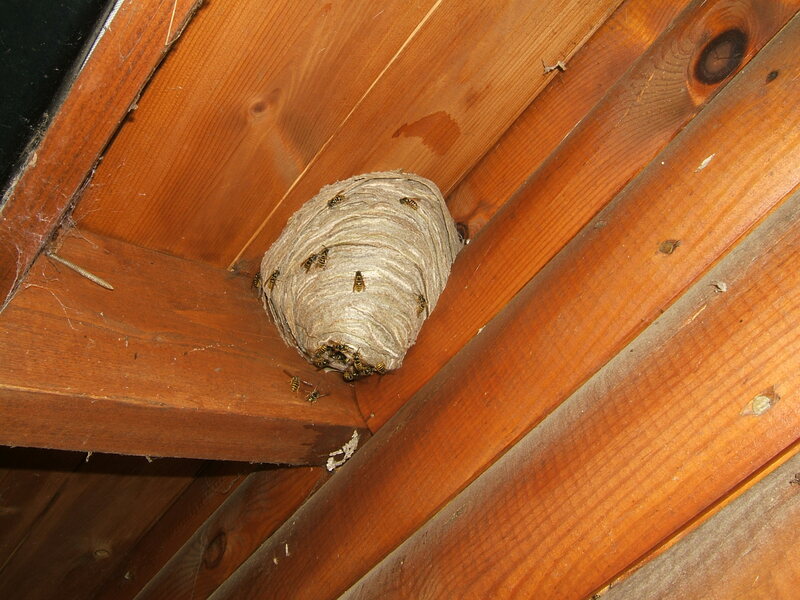 Wasps nests can be destroyed in any location on your property. We offer a same day service for local emergency call-outs. Our service is guaranteed and our regular customers rely on this to keep wasp-free all Summer long. We are constantly improving our wasp control method, reducing pesticide use to the minimum or zero (Organic wasp removal). We have hundreds of repeat clients over many years – our service is THAT good! To treat a wasp nest is £45.00 (no vat) additional nests are charged at £15.00 each when treated at the same visit. We can keep our prices low because we use an absolute minimum of chemical and use proven tools to deliver the dose. Full safety checks are conducted before any work is carried out, keeping everyone safe. Organic wasp nest removal. 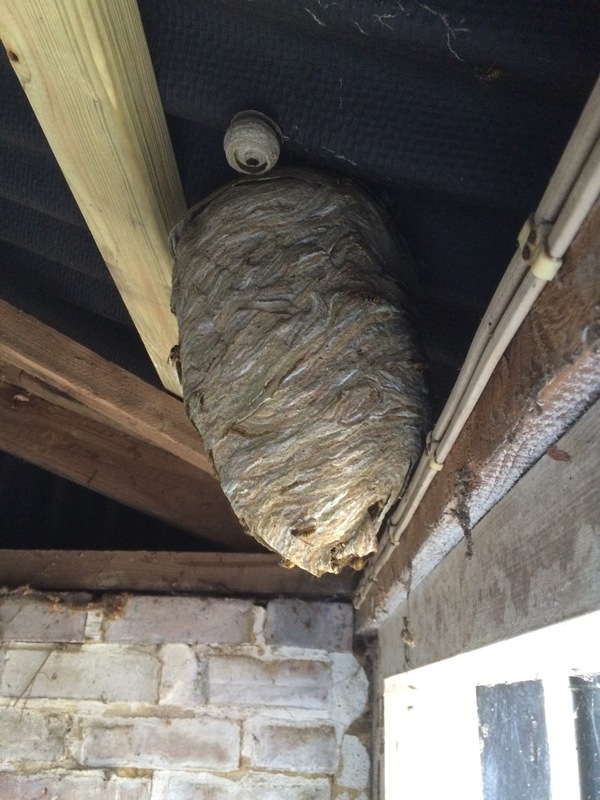 We can offer chemical-free wasp nest removal when the whole nest is visible or accessible. Please call to discuss your requirements. Please note that just removing the nest will leave thousands of unhappy wasps looking for sweet food. These are very likely to sting, especially where food is consumed or prepared. Our service is tailored to reduce the likelihood of this happening. We also sell and install professional wasp traps where there is risk of stings from displaced wasps. Natural wasp control is the favoured option when, for example, wasps are in compost heaps, near fish ponds, in or over water tanks, areas where food is stored or prepared, in animal housing, in fact, anywhere that pesticides pose a risk to the environment or occupants. 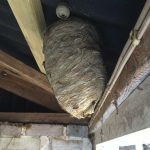 Our chemical-free wasp nest destruction is becoming more popular each year, but does take more time and planning than conventional methods if it is to be safe. See below for bothersome wasps around food or fruit. 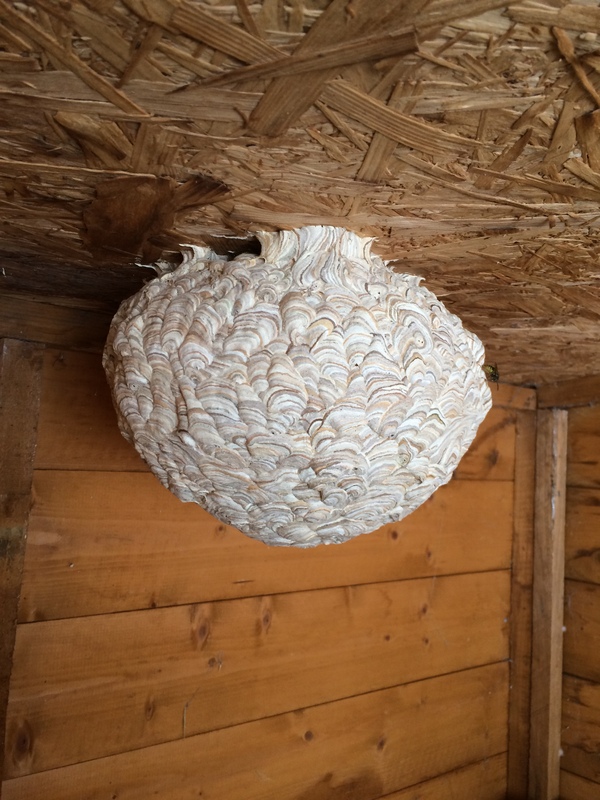 Why choose us to remove a wasps nest? To eradicate a wasp infestation on a DIY basis is a dangerous and unpleasant task, even when using modern wasps nest destroyer sprays. The risks of serious injury or worse become greater as Autumn approaches and the nests get bigger and more aggressive. Therefore, we strongly recommend getting a qualified, professional pest expert with the correct training, equipment and insurance to kill wasp’s nests. Many serious accidents and even deaths have occurred because of amateur or unskilled treatments going wrong. We have the correct training and appropriate qualifications and equipment to exterminate wasps correctly. We will destroy the wasps using the latest techniques and the least hazardous method of treating the nest. Wasp nest removal is possible when the nest is visible and dead. It will not be used again, and in most cases will not require removal. 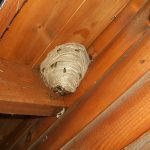 If you suspect there are wasps living in your house but cannot find the wasp nest, we can inspect your property with a trained eye. This may be particularly useful if you are allergic to wasp stings or worried about children getting stung. Finding wasps nests cannot be guaranteed of course, but an experienced look at your home or workplace may reveal hidden nests. If you have wasps getting into your house we can deal with the problem quickly and efficiently by finding the nest, or where wasps get in, sealing the hole and treating the wasps nest. Finding dead wasps in any number is a sign of a nest nearby. Here at Nature in Balance, our wasp control services go far beyond just treating problem wasp nests, we can help to stop wasps bothering you. 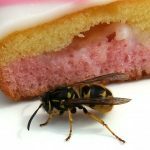 This is an important element to wasp control, because wasps that are being bothersome are not only far more likely to sting, but will also transmit disease by walking on our food. With careful planning and strategic use of modern technology, we can drastically reduce the occurrence of annoying wasp problems. This is not a case of using a few wasp traps to distract them, indeed, incorrectly used, poor quality traps will actually make the problem worse. In line with our chemical-free control methods, control of annoying wasps is environmentally safe. Nature in Balance has been trained in the correct implementation of wasp management techniques, keeping nuisance wasps to a minimum around food. Are they bees or wasps? Between late March to May, many different bees appear, such as masonry bees. These look very similar to wasps, and although solitary, may appear in large numbers in one area. If you are unsure, we can identify them correctly. These solitary bees cause no harm and are extremely beneficial. Why get rid of wasps? Wasps are beneficial to our ecosystem, and therefore we will only treat a wasps nest if it is, or is likely to cause a nuisance or safety issue. Occasionally, wasps and hornets build their nests where they will become a problem when the nest gets bigger and the wasps become aggressive. Apart from being very painful, a wasp sting can be dangerous and occasionally fatal, especially or those that suffer severe allergic reactions or have known or underlying heart problems. If the wasp’s nest is approached or disturbed in any way, the wasps attack, each one capable of inflicting multiple stings. For a press article, click here. Apologies for the picture, which is neither a wasp nor a biting insect – its a harmless Hover Fly! Occasionally, wasps will chew through plaster board and get into the adjacent room. The problem is often preceded by a crunching noise and/or a stain on the wall/ceiling. Hornets cause similar problems but are much less aggressive. They are fairly common in Surrey, Hampshire and West Sussex. One of the main problems with having a hornet nest near your home is their habit of coming indoors in the evening, usually flying around the light. Customers not eating or drinking outside? Wasp problems around kitchens or bins? Just how much business are you losing because of nuisance wasps? The reality is that you could be losing thousands of pounds in lost business simply because of bothersome wasps. People being pestered by wasps may leave bad reviews, damaging your reputation. 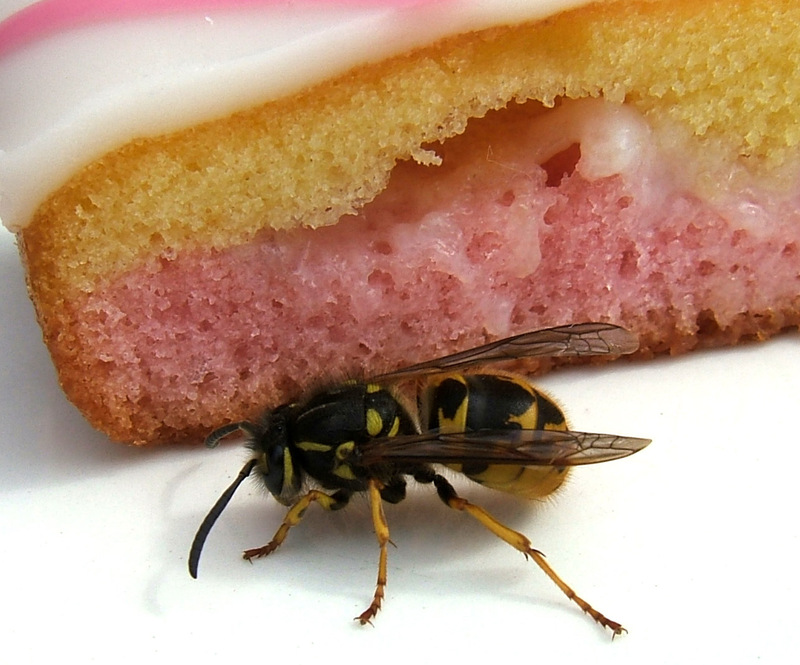 Your customer may experience stomach upsets because of wasps contaminating their food. Wasp stings are extremely unpleasant, can be fatal or lead to other health problems. As a business owner, you have a duty of care to reduce the risk of wasp stings to staff and customer, and we can help you fulfill this requirement. Our wasp control and management services go far beyond just treating problem wasp nests, so why not take advantage of our free survey for commercial premises and see the HUGE FINANCIAL BENEFIT of controlling wasp problems. Wasps start to appear in late spring. These will be queen wasps that have overwintered with fertilized eggs inside them. The queen wasp builds a round nest out of chewed wood (pulp) which will be roughly the size of a golf ball. She lays her eggs in the nest and tends them when they hatch into grubs. The grubs grow and then pupate, emerging as small worker wasps. At this point, the queen wasp stays in the nest and is tended by the workers while she lays eggs. These worker wasps also start expanding the nest and hunting for caterpillars and aphids which they feed to the next batch of grubs. The wasp grubs produce a sweet substance which is fed to the worker wasps. With this cycle replicated time after time, the wasps’ nest can become huge and contain many thousands of wasps. Towards the end of summer, the nest produces male wasps and queens which mate, the queens flying off to overwinter with fertile eggs ready for the following spring. There are now no grubs in the nest to sustain the workers, so they go in search of sweet substances. They feed on fallen fruit and may become slow due to the cooler conditions. Aggression levels appear higher at this time. 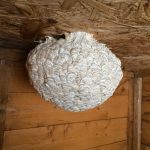 You can often find a wasps nest in the loft, but wasps will also build a nest in your shed, garage, in a hole in the ground or in a bush. If you are looking for a wasp nest on your building, you may find them going under tiles, into a window frame, going into air brick, into the sofit board or brickwork. Look for regular wasp traffic in and out of holes and cavities. The most common problem is wasps going into the eaves. We have treated wasps nests in hats, in the foam of patio furniture, in water tanks (non toxic removal) and among animal feed, to name but a few! Asian Hornets have been found in Gloucestershire. Bad news for bee keepers. Click here for Government press release.